SPLASH! is the leading trade publication for the Australasian “wet industry”, incorporating the swimming pool, spa and aquatics industries. It is the only independent website dedicated to servicing Australia’s swimming pool and spa industry professionals. Key elements of the website are the news coverage, hot products, comprehensive Blue Pages product directory, archived magazines, upcoming events and industry links. Another online element is the popular free fortnightly e-newsletter – subscribe. SPLASH! also publishes the annual hard copy Blue Pages product directory. In addition, SPLASH! organises the bi-annual SPLASH! Environmental Awards – the world’s only dedicated swimming pool and spa awards for environmental innovation and practice. SPLASH! is a partner of the EEAA-awarded “Best Show in Australia” – the SPLASH! Pool and Spa Trade Show on the Gold Coast – and SPLASH! Asia in Singapore. Published bi-monthly, SPLASH! magazine provides detailed coverage of the latest industry news, case studies, projects and in-depth discussion of the big issues affecting the industry. 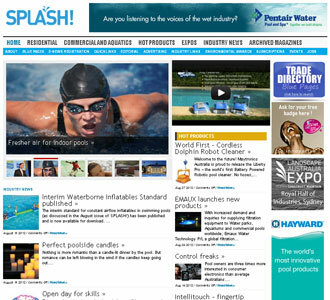 Dedicated to delivering the most comprehensive editorial content, SPLASH! is essential reading for anyone involved in building, designing, maintaining, marketing or managing swimming pools, spas or related equipment and services.